Microsoft has announced that by the end of the year the Groove music service will be phased out. Users are being offered the option to move their music libraries into Spotify. This brings to an end a long story of Microsoft in the music distribution business. It started nearly 15 years ago with technologies in Windows that allowed for purchase and playback of various media formats. Microsoft sought to enable a large number of music retailers to market music through its formats and DRM and transaction clearing. Services such as AOL MusicNow, Yahoo! Music Unlimited, Spiralfrog, MTV URGE, MSN Music, Musicmatch Jukebox, Wal-Mart Music Downloads, Ruckus, PassAlong, Rhapsody, iMesh and BearShare and dozens of hardware players licensed Windows formats. Almost all of these services have shut down and the devices disappeared. The next stage was to offer an integrated experience through the Microsoft Zune player and Zune Marketplace music service. This too failed and was replaced by the Xbox Music brand in 2012. On July 6, 2015, Microsoft announced the re-branding of Xbox Music as Groove to tie in with the release of Windows 10. There was a time when Microsoft was thought of as the certain winner in media distribution. Inserting media into the Windows hegemony was classic “control point” strategy: owning the access points was a sure way to collect a tax on what transacted through the network. Instead we are facing a market where media is consumed through new access points: phones, tablets and TV boxes. Netflix, Spotify, Roku, Google, Amazon and Apple are all offering distribution and some are investing in original programming. It’s perhaps worthwhile to recall that Microsoft and Apple both started their media efforts around the same time. Apple’s iTunes is 16 years old and the iTunes Music Store opened in 2003, almost 15 years ago. 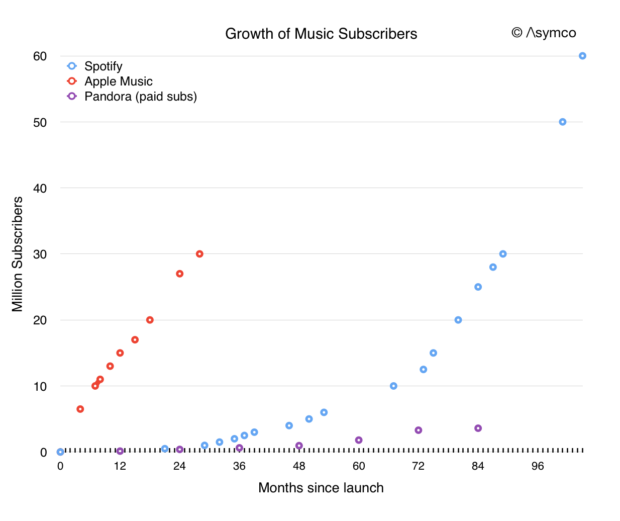 Today Apple is transitioning to streaming with 30 million subscribers. The graph below shows the history of subscription growth to Apple Music and Spotify. Apple Music is a small part of Apple Services (part of the orange area below). 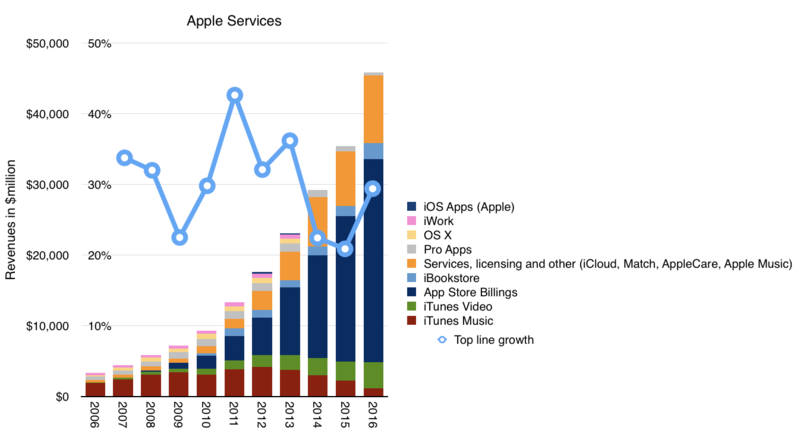 On a yearly basis Apple Services are this year crossing the $50 billion gross revenue run rate. This year Apple released a new Apple TV 4K and is releasing a new smart speaker called HomePod. The contrast between Microsoft and Apple is most visibly between the Mac and PC. But the story of how media paralleled mobility and how Microsoft struggled with both is perhaps a cautionary tale. 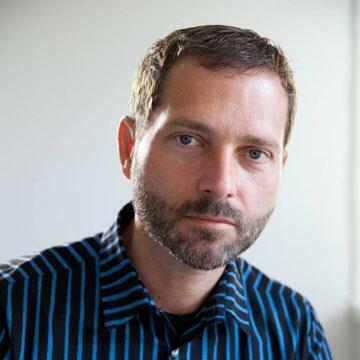 Microsoft saw the limits of modularity when new product categories emerged and when new user behaviors were created. They attempted to pivot into being more integrated but those efforts also failed. The efforts continue today with Surface devices; looking forward they will continue with AR/VR and perhaps a pivot of Xbox.. But the long arc of history shows how hard it is to succeed in vertical integration after you build on horizontal foundations. Generations of managers graduated from the modular school of thought, specializing rather than generalizing. Now they are facing an integrated experiential world where progress depends on wrapping the mind around very broad systems problems. Entire industries are facing this orthogonal pivot: media, computing and transportation come to mind. Huge blind spots exist as we see only what we’ve been trained to see. › Next Post Does the iPhone 8 have what it takes to be a success?